Fancy drinking some free beer made by a local brewery from hops that you have grown? If so then Palace Pint wants you! The palace pint it looking for more people to get involved with this great community project. Growing hops is easy! Just plant in pots or straight in the ground. The hops are a dwarf variety (Prima Donna), which grow to just 7-8ft so are suitable for most gardens/patios. Growers exchange tips and advice through the year on the Palace Pint Facebook page, then in the autumn the hops are collected and turned into the Palace Pint by Penge-based micro-brewery Late Knights. They donate a generous amount of beer to the growers for a 'bit of a do' once it's brewed! In 2014 more than 100 plants were grown, and the resulting beer was pretty fantastic. The do was held at the Beer Rebellion (a local pop-up bar that sources from small producers) - and a very good time was had by all! The hops are easy to grow, look attractive and smell wonderful once ripe. 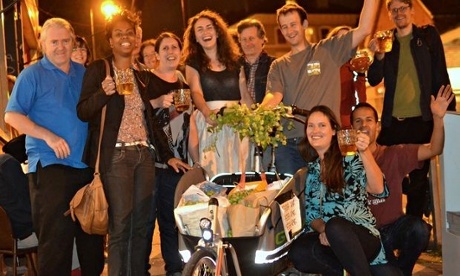 It's a chance to meet other like-minded beer lovers (or even plant enthusiasts). It's part of an exciting and growing grassroots movement which, from its Brixton origins in 2012, has already spread as far as Wales. We get to drink our own unique beer and have a great knees-up at the end of the season! We can all feel we've contributed to a truly unique and local product. Orders are closed for this year. It's hop collection night at Beer Rebellion and the Palace Pinters are enjoying a pint or two.